CHARLOTTE, NC, Sporting Alert – Live college football games streaming live on ESPN3 and on Saturday, December 5. Highlighting the list of fixtures live on ESPN3 this weekend is the ACC Championship Game between No. 1 Clemson and No. 10 North Carolina. 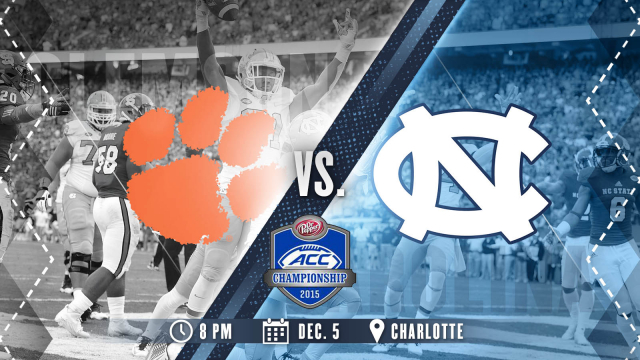 The game will take place at Bank of America Stadium in Charlotte, NC and kick-off time is listed for 8:07 PM ET. ABC will provide the live television broadcasting coverage, with the action also streaming on WatchESPN. Clemson (12-0) is looking for its 13th successive victory of the season as they seek to lock down a College Football Playoff semi-final spot. North Carolina (11-1) has won a school-record 11 straight games and will be hoping to spoil the Tigers’ party and perhaps force their way in the college football playoff semis. Meanwhile, Clemson heads into the matchup on Saturday leading the overall series with North Carolina, 36-19-1. The Tigers have also won five of the last six contests, including the 50-35 victory last season in Death Valley. However, college football fans can brace themselves for a different kind of battle this term, as the Tar Heels strongly believe that they have the quality to not just beat the nation’s No. 1 team, but crush them. Clemson QB DeShaun Watson has thrown for 3223 yards and 27 touchdowns thus far on the season. The sophomore from Gainesville, GA enters with a QBR of 81.6. Last year against the Tar Heels, Watson threw for 435 yards and six touchdowns. North Carolina QB Marquise Williams has passed for 2605 yards and 15 touchdowns this season, but was picked off three times at Saturday’s venue in the season opener against South Carolina. He will need to clean up this area on Saturday or else UNC has no chance of beating Clemson. Last year in this battle, Williams threw for 345 yards and four touchdowns. He also threw to 13 different receivers in the defeat. Meanwhile, also streaming live on ESPN3 is the American Championship Game between No. 22 Temple and No. 19 Houston at TDECU Stadium, Houston, TX and the Pac 12 Championship Game between No. 7 Stanford and No. 20 USC at Levi’s Stadium, in Santa Clara, CA.